There’s nothing like work done by the hands of a true master. 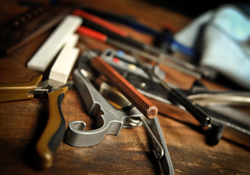 Let Greg Voros (guitar restoration specialist and master luthier) put his touch on your instrument. If you’d like to have a trained professional do the needed work on your guitar, here is your chance to have one of the top men in the field handle the job. 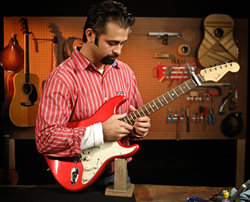 Whether you need a straightforward guitar setup or extensive repair/restoration, Greg Voros will carefully service your instrument. That’s Legacy Guitar Services. Contact Greg via email at: greg@gruhn.com and explain the services you would like completed on your instrument. 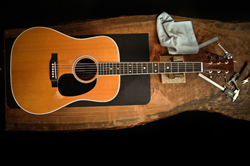 Pack up your guitar using the Packing and Shipping Guidelines. Greg receives the instrument and does the setup. In the case of more involved work, Greg will contact you with his estimate* before beginning the work. Once you agree to the work, he proceeds to finish the job and will charge you accordingly. If you decide not to proceed with the work, you will be charged for the shipping to send your instrument back to you. *Greg will personally examine the instrument and give you his professional opinion, making a recommendation based on whether or not the repairs would be cost effective in relation to the value of the instrument. Q: How long will I be without my guitar? A: You should figure for the time it takes to ship the guitar to us—then Greg does a pick-up/drop-off run to our office on Mondays and Thursdays. You will hear from Greg within a couple days after he picks up your guitar with an estimate of the time and cost for the repairs. Then there’s the ship time back to your location. For general setups, Greg will return your guitar to us on the next drop-off date. A: You should figure for the time it takes for the guitar to be delivered to Greg, then allow a few business days for Greg to form an estimate of the time and cost for the repairs. From there, you should figure the time for the repair, and then finally the ship time back to your residence. Q: Will my guitar be insured when it is returned to me? A: Yes! Shipping insurance will be purchased for the instrument when it is shipped back. Q: How do I pay for the final bill? A: Greg will inform on the methods of payment for the repairs and/or restoration when he provides the estimate for the work to be done on the instrument.